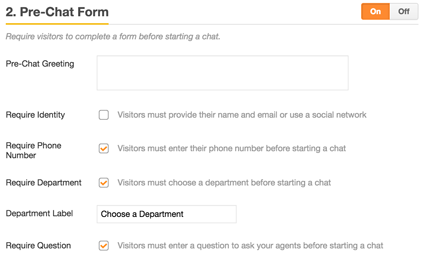 You can require customers to enter information, like name, phone number, or a question, by enabling the pre-chat form. From the dashboard, select Settings > Widget. Click Forms at the top of the page. Next to Pre-Chat Form, click On. For the Require Phone Number option to appear, you must select Allow Phone Number under the Visitor Profile section of the same page. For the Require Department option to appear, you have to have departments enabled. For details, see Creating agents and departments. I wanna add Attachment field on Pre-chat Form, how to do that? This is currently not possible in the Web Widget and Chat Standalone widget. Can we amend the language for "Choose a department" ? I'd like to translate it in two different languages, everything is translated instead of this section. I've set up triggers to automatically route chats between our two departments, one based on the exclusion of the other so it covers all visitors. Is there a way to hide the Choose a Department field? We want this to be on our side only, not in the customer's control or view. i setting live chat box require phone number. but about 15 second live chat box auto open. how i can turn off this(auto open live chat box though visiter not input any things ). You have a trigger turned on, you can turn off the triggers by going to Settings---Triggers inside the Chat dashboard.